there is and its in the pixel persona...hello hello am I here ....is anyone there .... am I alone...... hello hellooo can anyone find me please. and good for you for finding it in AP. Teejay You have hit the nail on the head Now why did I not think of that Off for some Danish beer and cheese Thank you everyone nice cheery place this. Any coffee brewing? you can paint on a layer and clip the painted layer to your shape. if you have a big ? over your head let me know its easy and essential to good vector work. there is a lot more to clipping.... many things can be done with this simple but awesome ability. just wrote that.. posted and then saw TeeJay beat me to it..
Jimmy, I'm not sure I'm understanding your question. Do you simply want to fill the hair with a color? If so, all you need to do is go to the colors (0r swatches) and pick a color. That's what I did in the image below. Selected the pen tool, clicked around the image, turned on the color and filled it with red. Just curious, why so many little nodes? The fewer the nodes, the smoother the lines. Now what have I wrong? How do I fix? Jimmy, you have a hole in the bucket and the paint keeps running out! In other words, you don't have a closed curve. The beginning and the end do not connect. However, there are a number of solutions to that. You could just draw a circle, then clip it to the hair. The problem with that would be if you changed colors... you'd have to change the circle too. You could draw a shape that's similar to the "hole", then use the Add function to add the two pieces together. This would let you change colors. You could just connect the beginning to the end but that might not work on this particular image. 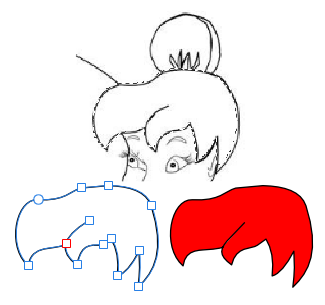 You could draw the hair as one object, then draw the bun as another and add them together. These are only some of the solutions. I like the last one best. Would like to make some suggestions for creating artwork with nodes. The fewer nodes, the smoother the image. Look at the image below. On the top part, I just clicked a bunch of straight lines at points where the shape changes. On the second part, I used the node tool to drag the curves into place. Use the pen tool to draw a line with a node in the beginning, one in the center, and one at the end. Change to the Node tool. Hover the node tool over the center of the line on the left side until you see a little tilde under the node tool. Holding down the mouse button, drag the line upward. It should form a nice curve. ( see image below). Repeat for the right side but drag the line downward. This is exactly how I made the hair on my example. I did have to adjust one or two node handles but that was no big deal. You can see how smooth the lines come out when using fewer nodes. I hope this helps. You are very welcome!! I love vectors and always challenge myself to see how few nodes I can use to create something. I learned this method by looking at how others made theirs. That helped a lot! What I don't like is coloring them after making them! Jimmy, I would strongly advise learning all there is to learn about using the Pen Tool. In my opinion it is the best tool in AD and other graphic programmes come to that. The Pen tool allows you free movement, In other words you can draw draw just about anything you want and shape it using the nodes. Another advantage of learning the Pen Tool and it's nodes is that what you lean is transferrable to other graphic programmes as they work to a similar format.